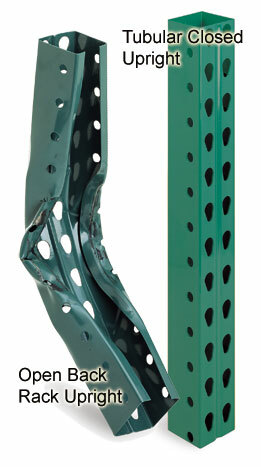 Blog Home > Material Handling > How Much Difference do Fully-Enclosed Pallet Rack Frames Make? How much difference can a fully enclosed pallet rack upright make? When it comes to the kind of significant injuries, product damage, and overall safety of a warehouse or commercial facility, the minor cost differences are insignificant compared to the potential savings if you prevent just one accident over the next decade. Imagine suffering an accident like this one. This video showcases 750 pounds dropped on both a conventional open-back and fully tubular pallet rack frame. Compared to the impact of even a slow-moving lift truck, that’s not an extreme amount of weight. While no rack can be guaranteed to prevent a collapse in the event of an impact, fully enclosed racks are simply more resistant. Always train your drivers to avoid collisions, always utilize post protectors, frame guards, guard rails and other safety equipment. But don’t forget the fundamental thing: the quality of the upright itself. SK2000 is the industry’s only 100% tubular rack, with 4 times more resistance to torsional forklift impact than open-back roll formed columns. It utilizes a tapered keyhole connection slot, interchangeable with several other rack systems, and allows 2″ vertical beam adjustments.